Make the most money trucking through Hick State County in 60 days to take control of the trucking company. Players can choose to play Bobbie-Sue, Cletus, Earl, and Rawkus and get behind the wheel of a fully customizable big rig in five distinct cities. With non-linear, mission-based gameplay you'll be traveling, hauling cargo, and making money in no time! 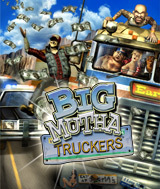 Play as one of four "unique" characters including Bobbie-Sue, Cletus, Earl, and Rawkus each with their own attributes and customized rigs. Haul various types of cargo that include anything from cell phones to oil to earn money. Battle bikers, avoid truck-jackers, and out-run the corrupt Police force.